John Monatgu, the 4th Earl of Sandwich, is credited with inventing that popular lunchtime staple, the sandwich. The story goes that in 1762, when hungry, he asked for meat to be served between slices of bread to avoid interrupting a hugely long gambling game. This snack soon caught on and as people started ordering “the same as Sandwich” the name stuck. Of course, the reality is that using bread to hold meat had actually been going on for centuries. A first century BC Jewish Rabbi is documented as starting a Passover tradition of putting lamb, nuts and herbs between two pieces of unleavened bread and in the Middle Ages people used thick slices of bread to double as plates for cooked meat and vegetables – a sort of open sandwich if you like. So, bread in all its forms has long been a great container, a tasty base or a perfect ‘wrapper’. Added to that, the fact that it is portable, and of course very versatile, working brilliantly with numerous different types of ingredients – as well as relatively easy and cost effective to produce – it’s no wonder the sandwich has endured. I’m not just passionate about baking bread, I genuinely love eating it….on its own… slathered with butter… dipped in olive oil – but it really comes into its own with a well thought-out sandwich. My chef background means I love to experiment, trying a variety of fillings and toppings with different breads in search of perfection. November 3rd is National Sandwich Day and if you’re stuck in a cheese and pickle or tuna mayo rut, here are a few of my current favourite combinations to try. 1) Generously spread two slices of our Seeded True Wholemeal with horseradish cream. Then make the filling with flaked smoked mackerel and slices of beetroot. 2) Using our Campagrain Bloomer, layer up a sandwich with roasted red peppers, and crumbled feta cheese. Top with sliced spring onions and a sprinkling of watercress. 3) For a delicious open sandwich and great lunchtime treat take a thick slice of our Sourdough with Fennel & Raisin and gently toast on both sides. Add slices of goats’ cheese and put back under the grill until it starts to melt and turns brown. Take out, drizzle with a little honey, sprinkle with a few chopped walnuts and serve on a bed of dressed leaves. 4) Our Artisan Baguette is one of my favourites and perfect for a hearty lunch. I like to fill mine with slices of good quality salami and provolone cheese and then add juicy sundried tomatoes and a little red onion. 5) Our Malted Granary Rustic Baguette is delicious spread with a healthy dollop lime mayonnaise and then filled with baby gem lettuce leaves, tiger prawns and thin slices of raw red pepper. 6) Try our tasty new Greenwich Rye bread and create a filling from pastrami, thinly sliced gherkin, red onion and rocket leaves. 7) You can never go wrong with a cheese toastie. My favourite mixes three cheeses – Montgomery’s cheddar, Comté and grated Ogleshield – which I then top with a little chopped red and white onion and a small amount of leek that I soften by frying in butter with a little garlic. The whole lot then goes into the sandwich maker until the cheese melts and the bread is golden brown. 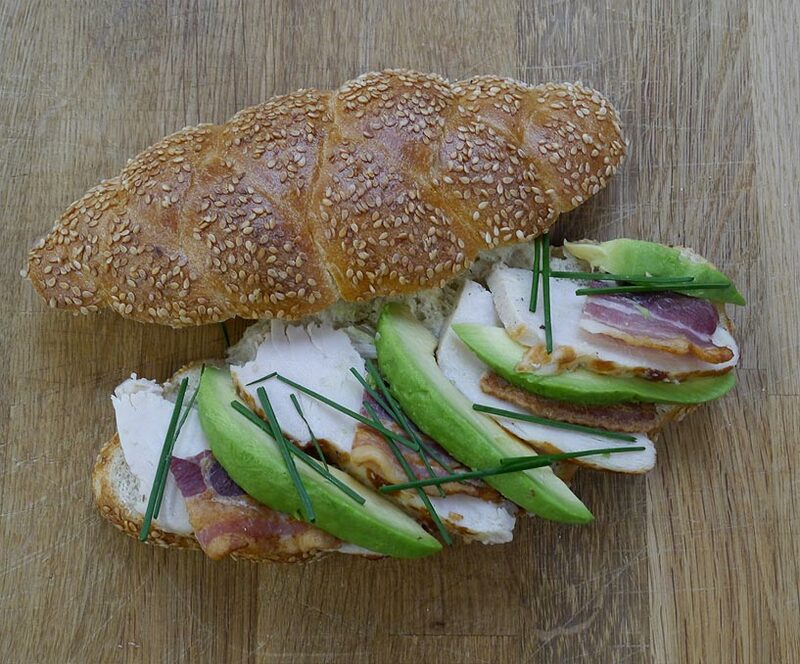 8) The best-selling sandwich at the Paul Rhodes Bakery shops is a plaited sesame seed roll spread with mayonnaise and then filled with smoked chicken, avocado, crispy bacon and chopped chives. 9) For a more continental sandwich take two slices of Ciabatta and spread with fresh pesto and aioli. Then add slices of plum vine tomatoes and fresh basil leaves and top with slices of Swiss cheese before popping in the oven until the cheese melts. 10) Take one of our Focaccia Baps with Garlic & Rosemary and fill with roasted vegetables such as peppers, onions and aubergines. Add slices of soft creamy Brie cheese and a little fresh flat leaf parsley. 11) Our tasty Mediterranean Flatbread with Middle Eastern spices makes a delicious wrap. Spread with chunky hummus, salad leaves and coriander, add Falafel and then roll up and enjoy. 12) The purists out there might think that Croissants should not be tampered with – but if they tried this tasty breakfast sandwich they might disagree. Sautee spinach and chestnut mushrooms in a little butter until cooked, then fill a sliced croissant with the mix, topping with Emmenthal cheese. Place in the oven for a couple of minutes until the cheese melts for a tasty breakfast treat. ©2019 Paul Rhodes Bakery Ltd and Paul Rhodes London Ltd. All rights reserved.